Congratulations to Karen Bjork, named a 2016 IR All-Star! This recognition comes from Digital Commons and bepress, the company that provides the platform for PDXScholar, the institutional repository (IR) of Portland State University. Karen is the Head of Digital Initiatives in PSU Library and manages PDXScholar and the Digital Initiatives Unit. “We are very pleased to announce the first of our 2016 IR All-Stars: Karen Bjork, Head of Digital Initiatives at Portland State University. Over the past several years Karen has been a vocal and enthusiastic member of the Digital Commons community, most especially with her tireless advocacy for cost-saving Open Educational Resources. “PDXScholar’s core mission is to provide a publishing outlet for scholarly work that does not fit other publication models. Since 2013 this has included PSU-authored open textbooks, created in response to the campus-wide ReTHINK PSU Provost’s Challenge and subsequent funding. Karen, with the help of her team, developed and managed the entire process, including vetting submissions, working with authors to complete and edit their manuscripts, and ensuring the addition of final touches like cover art. There are currently eleven books in the repository’s PDXOpen collection and more on the way in the coming months. This initiative has already saved students $59,000. This collection is a clear way for the library to align with key campus missions. Under Karen’s direction, PDXScholar has become an extensive and diverse repository with over 12,000 papers and nearly 725,000 downloads in the past year. Indeed, Karen has worked hard to develop a wide range of collections, including partnerships with Special Collections and University Archives as well as with a number of research centers and institutes on campus. PDXScholar also boasts a wide range of traditional faculty papers, campus conferences and symposia, and journals and newsletters. At a school that prides itself on high-quality student work, Karen has recognized and highlighted the value of undergraduate research and projects, making sure to prominently feature a variety of undergraduate work in PDXScholar as well. One of the things we most appreciate about Karen is her willingness and eagerness to share her strategies and her passion for repository management. Last fall, she presented an informative bepress webinar about her work with Open Educational Resources at Portland State, and she has presented on related topics at a variety of conferences. Most recently she helped coordinate the first Northwest Institutional Repository User Group, held at her home institution. 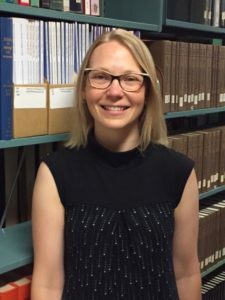 We look forward to continuing to work closely with Karen in the future as she continues to push PDXScholar to the forefront of university repository standards. We are delighted to see this recognition of Karen’s work and her many contributions to Portland State University. Congratulations, Karen!